So what am I doing with all my spare time now Wanderer Book Four is with my editor? Well I’ve been really busy writing! I’ve started developing a new sci-fi universe (the Starflare Universe) and have createed two short stories in that universe. The first, called Ghost Starship, is about 14,500 words and the second, called Fuel Pressure, is almost 1,700 words. I’ve got a few other ideas for short stories in the same universe which I want to write and I’ve also written a couple of standalone short stories (Cheating Death @ 1,900 words and Anti-Virus @ 440 words). Much as I love writing novels and developing universes it’s been great fun writing some fun, standalone, short stories too. I have several parallel plans for these short stories, which I’ll be talking about more in a post soon. For now though let me move onto the big news. Once I finish writing short stories over the next four to six weeks I’ll be starting on Wanderer Book Five. That’s right – the next book I write is going to be the final book in the Wanderer’s Odyssey series. The original plan was to write another book first and I got about 25,000 words into that story before realising it wasn’t really working as I’d intended. I was trying to write something which I now realise didn’t really click with my style. The story was very good but it kept wanting to veer off from where I wanted it to go, so it’s parked for now. It may end up being a long short-story / novella, or I might pick it up and weave some more plot threads in (I can see a few that would complement it well already) and write it in the style that works for me. 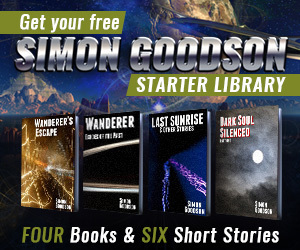 The important thing is that having spent the time on that story, and on the recent short stories, I not only feel refreshed and able to think about writing Wanderer book five, I’m actually really keen to do it. I want to know what happens and how things will end up – some of which I think I know but my stories have surprised me in the past! Are you excited that book five will soon be started? Leave a comment and let me know! I was expecting book 4 in “early 2015.” I never thought September was early in the year. I just bought book 3 and I’ll forget how it ended by September. That was the original plan but the times shifted out as the book became longer than I expected, including about 15,000 words which I eventually realised belonged in book Five not book Four. Have I left references to “early 2015” anywhere in a book or on a comment / blog post? if so please let me know so I can correct them, and sorry for any confusion. Ah – found it in the back of Wanderer – Tainted Universe. Sorry for the confusion, I’ll get that removed soon and replaced with correct information.